I am someone that really loved ink and tattoos, but can never really decide what I want. I do have ink which I love, but I had to think long and hard before I got it as I knew it something that I would have for life. I have to admit, I do love all sorts of ink on other people. I think big, dramatic tattoos can look fantastic on people and would always encourage people to get something they love if that is a route they wanted to go down. Whether I'll have the same opinion when Darcy is 18 is something that remains to be seen! Although I have never had to think about removing tattoos, I was recently introduced to city tattoo removal at pulse light who offer this service. It got me thinking about what I would do if I decided I wasn't a fan of mine any longer, and I guess laser removal would be a good option! 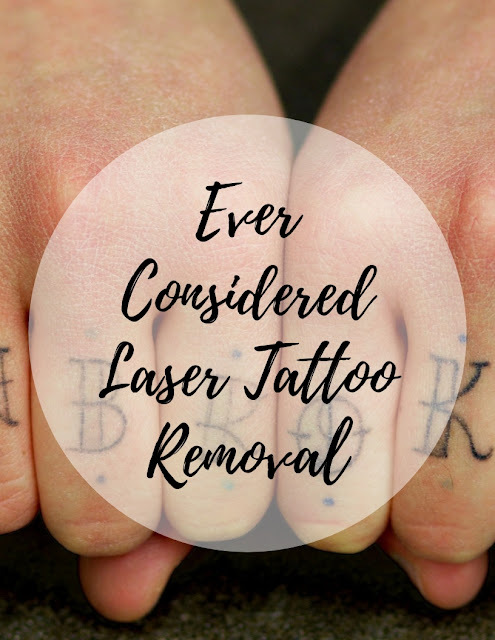 Laser removal success can depend on the type of tattoo you have and how dark the ink is. You'll more than likely need a couple of sessions in order for it to do the job as successfully as you would like, but it can work. The idea is the laser sessions fade your tattoo enough that you'll be able to get a new tattoo designed as a cover-up to disguise the original tattoo that you no longer liked. So far I have never had anything like a partners name tattooed on me, but it's good to know that should someone do this and then things go sour, there' no need for anyone to be left with the name of an ex partner branded on them - which sounds like good news to me! Of course, anything like this you should look into and research yourself, however, I have to admit reading up on this it sounds like a pretty positive thing for those that need it.